When the War broke out, Service tells us in Harper of Heaven (67), he offered himself to the Seaforth Highlanders. A medical officer told him he couldn’t possibly serve in the Army with his varicose vein. 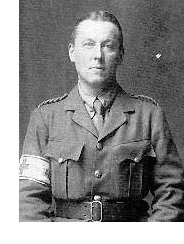 His friend John Buchan tried to persuade him to get a commission by joining the Officers Training Corps; but Service professed to be unnerved by the thought of leading men or, indeed, having responsibility. He decided to be a war correspondent instead, as he had been in the Balkan Wars in 1912. He went to Calais, and all the journalists there told him not to go to Dunkirk. So he went to Dunkirk. He wandered around, marvelling at the Indian troops, and the German prisoners-of-war being marched through the streets. All day I dodged from one vantage point to another, seeing a hundred things I was not supposed to see. And I was innocently happy thinking how I was getting ahead of the boys back in Calais. That evening I was arrested. I was watching ambulances load the wounded on a train when suddenly a gendarme pounced on me (HH 68-69). His passport was examined; it had all kinds of visas, including German ones, and he was accused of being a spy. “At that moment Dunkirk was having a wave of spy fever, and they were shooting suspects at sight” (HH 69). It was only when the French authorities took him to the English captain of the port that he was cleared, and made to go back to Calais. From there he went to Paris, but felt that he was just too far from the action. It was at that point that he read that an American Ambulance Unit, attached to the French army, was in need of drivers. He was taken on. He went to London to buy a uniform, though he did not like to wear his Red Cross armband, “for I was ashamed I was not a combatant” (HH 72). A week later I was driving an ambulance under fire. It was on a long stretch of Flanders road, and I had five wounded in my car. […] I had felt no fear, only a thrill that had something of pleasure it it. I had been under fire […] Our headquarters were in a château where we slept on the floor and had food provided by the French army. But we all contributed for extras so that our fare compared favourably with the best officers’ mess. Dinner every evening was a scene of hilarity. Wine flowed freely and everyone was in high spirits. Perhaps there was something feverish in our gaiety, for we were keyed up by the events of the day. We joked, laughed, sang, told stories, anything to make us forget the roar of the cannon that sometimes seemed to rock the ground about us. It may seem a dreadful thing to say, but we were actually enjoying the war (HH 72). After a while, longing for more excitement, he volunteered for outpost duty, closer to the front lines. Sometimes they would go onto No Man’s Land to pick up wounded men: “the danger enhanced the heartening feeling of saving life” (HH 73). The night driving was the worst. We could not show the faintest light and the roads were pitted with shell holes, It was nerve-racking, crawling on low speed with a badly wounded man along those coal black devastated roads. Once I had a soldier die in my car—but I prefer to forget that. There is so much I want to forget. Those who went through the horror of war never want to talk about it. But if there was slaughter, they was also laughter. We would laugh a lot, mostly about nothing, and we became very callous, grumbling if brains or guts spoiled the car. We were sorry for the poor devils but saw so many they were like shadows (HH 73). In the early stages of the war I felt no fear. I used to prowl close to the frontline, and once or twice got myself into trouble. In some cases the German trenches were only a few yards away, so I got a thrill out of the nearness. To think that I was exposed to fire bolstered my self respect, and sometimes I would leap out of a trench in full sight of the enemy lines. I was a show-off and a fool. That I did not get a bullet in my hide was no fault of mine, for I loved the twang of them. But towards the end I got jumpy, hating the near-by crash of a shell and its concussion. War does not improve on acquaintance. It resolves itself back into filth, confusion, boredom. Though I tried to avoid the latter by courting danger, in the end I came to realise I had a yellow streak a yard wide (HH 74). He became ill, with painful boils, and went to his house in Brittany to convalesce. There he had the idea of writing verse about the war: he had not written anything while he was actually at the Front. He wrote about three poems a week, and after five months he had over sixty. When it was published the book—Rhymes of a Red Cross Man (1916)—was hugely successful. And some is bad, and some is worse. The red resentment of the guns (from Foreword). When the Americans entered the war, the American Ambulance Unit was dissolved. “All those young Americans who talked with an Oxford accent and wore handkerchiefs in their sleeves had joined the regulars” (HH 77). Service wanted to get “back into the Show” (HH 78), and he landed himself a plum job. One day I received a letter from the Canadian Government offering me a war assignment. It was one of those things a writer dreams of, a commission to tour the country, reporting the activities of the Canadian Expeditionary Force. I was to have a Cadillac, a chauffeur, an officer guide and freedom to choose and plan my itinerary. So, buying a new uniform, I fastened on the green band of “Intelligence” and very proud I was of it. “Intelligence” sounded army-ish and implied a modicum of mentality. But one of the official war correspondents sneered. On his shoulder-straps he had a nickel badge with the letters “W.C”. “Why don’t you get one of these,” he said, “instead of that green abomination?” “I would, only I don’t want to pass myself off as a fighting man,” I answered As he was of military age he gave me a nasty look (HH 78-79). He was able to visit the entire Front. He saw the grave of his brother, who was killed near Ypres. He followed the retreating Germans eastwards; he even captured three Germans himself, marching them up to the nearest Tommy. Everywhere were macabre scenes like the chamber of horrors of some super Madame Tussaud. […] Heaps of bodies littered the ground. Some were headless, some mere torsos, like butcher-meat fresh from the slaughter-house. Dead, dead everywhere—so many of them. One hoped they would be buried before they had time to putrefy. But the burial parties were working night and day. . . It was so terribly tragic, this last of the battle-fields” (HH 81). It was a wonderful time, a revival of hope, an almost incredible realisation of victory. Despite death and desolation hearts were high and everyone seemed keyed up for the grand climax (HH 81). Service was, he claims, one of the first of the Allies to enter Lille, before the British troops: acclaimed by the crowd and welcomed by the mayor himself. He went back to Paris, and typed furiously on his Remington to get it all down. He was typing one morning, at about eleven, when he heard the bells of Paris begin to peal. The concierge told him that the war was over. For a while I remained in the midst of it, carried away by the extravagances of a mirth-mad mob; then I tired of it all. I thought of those out there who had given their lives for this, and for whom no one in all that cheering multitude had a single tear. So back to the Rabbit Hutch I crawled with sorrow in my heart. There on my desk were the articles I had written with such enthusiasm—excellent work, a month of effort. With sudden loathing I looked at them. I need not go on. Taking up my manuscript I tore it in tatters. That ends it,” I said. “No more war. Not in my lifetime. Curse the memory of it. Now I will rest and forget. Now I will enjoy the peace and sweetness of Dream Haven” [his house in Brittany] (HH 84-85). Service wrote two volumes of autobiography: Ploughman of the Moon: An Adventure into Memory (New York: Dodd, Mead and Co, 1945), which took the story up to the point when he left the Yukon, and Harper of Heaven: A Further Adventure into Memory (London: Ernest Benn, 1948), which begins with his return to Europe.